The Spangle comes in two forms, the single factor and the double factor Spangle. The single factor has just one Spangle gene whilst the double factor has two. For now I will discuss the physical appearance of each. The single factor Spangle has the markings on the wings, the throat spots and the tail feathers altered. The wing feathers appear to have a black edge with either a yellow or white center, and are often described as having the normal markings reversed. 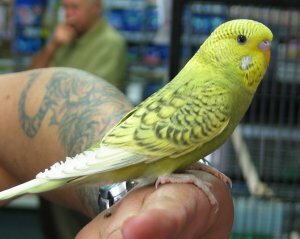 I do not like this description as it is clear when looking at a Spangle budgie that the feathers still have the white or yellow edge, then a thin black pencil line, then the center of the feather is yellow or white. The throat spots are often all or partly missing but if present look like targets, with a yellow or white center. The long tail feathers can be like the wing feathers with a thin line near the edge, or they may be plain white, yellow. 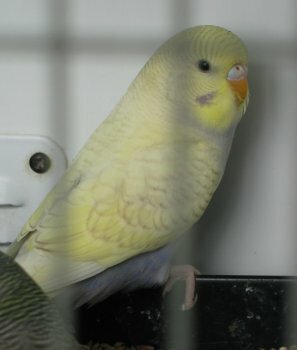 The double factor Spangle is a pure white or yellow bird, though sometimes with a slight suffusion of body colour. Both types of Spangle have normal dark eyes with a white iris ring and normal coloured ceres. Their feet and legs can be grey or fleshy pink, single factor Spangles can have either violet or silvery white cheek patches (or a mixture of both) and the double factor has silver cheek patches. 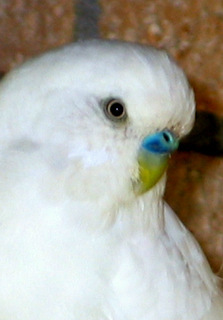 The white double factor Spangle above, in the right column, shows the dark eye, with an iris ring, that distinguishes it from both Albinos (would have a red eye) and Dark Eyed Clears (would have a dark eye without an iris ring). Spangle can combine with any other variety to create many lovely mixes. Spangle Opalines are common and can vary a lot in their appearance. The markings are reduced over the head and shoulders, and the body color is present on the wings. 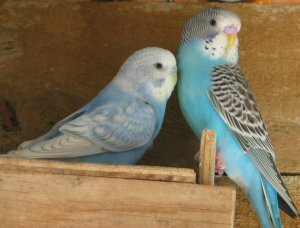 The budgies above are a Normal Skyblue and a Cobalt Spangle Opaline. 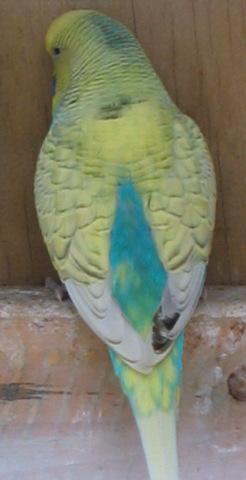 The Spangle Opaline has lost some of its markings and has a lot of cobalt on the wings.It is not uncommon for the markings on a Spangle Opaline to be body coloured rather than black. 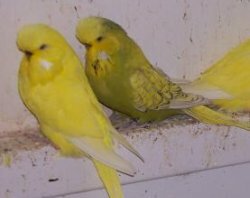 On the right is a Grey Green Spangle Opaline. It has heavier than usual markings for a Spangle (which I really like) and less body colour on the wings. 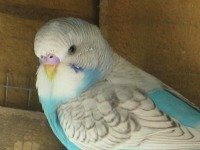 Below is a Skyblue Spangle Yellow Face Type 2, a nice shot of the spangle markings showing how you can get the occasional heavily marked feather sneaking through! Spangle is an incompletely dominant gene. This means it has three forms, the Non-spangle (Normal), the Single Factor Spangle and the Double Factor Spangle. See the incomplete dominance page. The Spangle genetics look simple on paper but in reality it sometimes does not act as expected. It would seem there is more to Spangle inheritance to be discovered, which makes it lots of fun! The last picture is a Violet Cinnamon Spangle Yellow Face Type 2. The markings are a lighter brown shade. I usually feel that this detracts from the Spangles beauty but this is one lovely girl!